PDF to HTML converter allows conversions of PDF documents into HTML format, which is more suitable for Internet publishing. The converter produces fully functional HTML documents with texts, pictures, graphics and bookmarks, using the original PDF document formatting and allowing for Internet publishing of your documents, thus exposing their content to search engines and significantly increasing your site audience. PDF to HTML software is a standalone program and does not require Adobe Acrobat, or even Acrobat Reader. 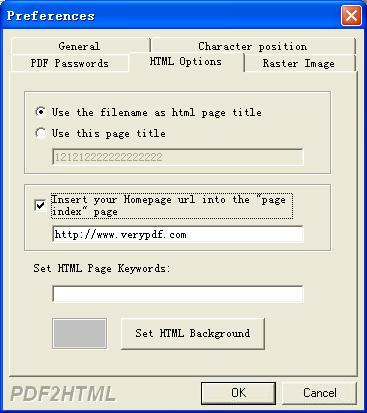 PDF to HTML is a shareware; the trail version of PDF to HTML can only let you convert up to 5 pages in one PDF documents. If you want to convert more, you must register it. You are allowed to process only up to one file simultaneously. 1) Convert only one file: select Open command from File menu, and choose the PDF file from Open PDF files dialog, there will be a Save as dialog popped up and you can enter a new HTML file name for your PDF file, then at last press OK button. 2) Convert PDF files: Operations the same as convert one file, notice the new HTML file names will be set by default corresponding to old PDF file names. 3) Drag and drop files: Just drag PDF file(s) to PDF2HTML main window from windows Explorer. PDF2HTML will receive the files and start converting. 4) Pause: If you want to pause while PDF2HTML converting files, simply click Pause button. You can click Resume button to resume converting. 5) Stop: Press Stop button will stop current job. 6) Option window as below can be showed when select Reference command from File menu. Select page range: Select all for convert all pages. Or you can select Selected pages and input page number into from and to text field to convert pages between these numbers. Output Zoom: Set percentage size for converted HTML file. 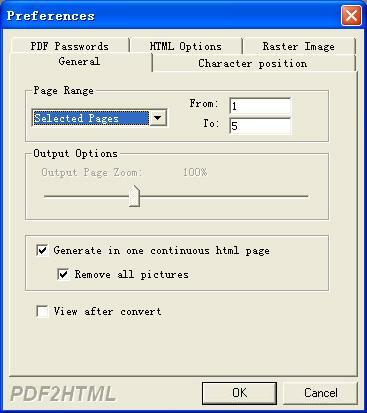 Convert a multipage PDF file into one continuous HTML page. Delete all pictures from the continuous html page, this option is useful for the Text-based PDF file. View after convert: Toggle this option to launch HTML file immediately after conversion complete. Auto combine neighboring characters into one sentence, this option will reduce the file size of the generated html file(s). Set user and owner password for the encrypted pdf files. 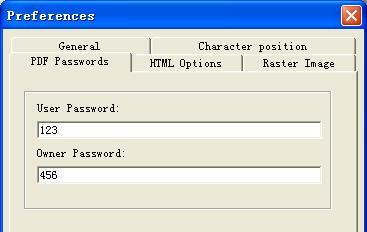 These options can be used for the html page title, keywords and background. Adjust the quality for the JPG file. Convert color JPG file to the gray JPG file. 7) Always on top: Toggle this option to make pdf2htm main window always on top. 8) Technical support: Send your questions via E-mail. 9) Register: Enter the correct series number for register. Once registered, all the function limitations will be removed. 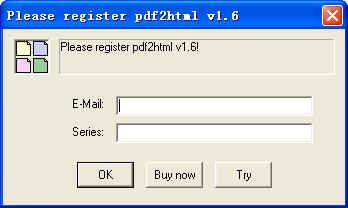 You can also click try to continuing use pdf2htm trial version without registration. PDF2HTML -q -m -r -i "c:\a.pdf" -o "c:\a.htm"
If you have any technical questions, suggests, bug reports, please contact us (support.verypdf.com).